You are here: Home / Blogging / What Is Viral Traffic Builder – Should You Get It? What Is Viral Traffic Builder – Should You Get It? When I first heard the name of this software, I thought “Oh no, not another bot program…”. But after some analyzing, it turned out to be quite legit. So what is Viral Traffic Builder exactly and how can it help your website? Let’s find out in this review as we dive into the social aspect of marketing. In other words, the automation aims to achieve more views, shares and comments on the social pages. This will create traffic that can lead to more engagement, boost page rankings on the search engines and subsequently, convert more sales for one’s website – whether it’s an affiliate blog, an online store or a small business set up. It will use niche keywords to find viral topics from over 30+ content sources within seconds. There’s no limit to the number of automation campaigns. Posts can be scheduled according to frequency, daily volume and set to publish on a specific time and date. The software can also be used with unlimited social media accounts. Due to the extensive capacity, the program is recommended for freelancers, affiliate marketers, online sellers, website flippers, marketing agencies and bloggers in general. There are two level of pricing and they are currently on discounts – The Standard costs $37.99 and The Premium costs $34.99 per time (Yes, you read that right – the Premium is actually cheaper). There’s also a one day trial where you can experiment the software for free without having to enter any credit card information. 1 – Considering how much other social media automation tools are charging for their plans on a monthly, the cost for this one is really affordable. The one time fee of about $30+ seems like a good deal for those who are just starting out and don’t have a lot of budget. 2 – In addition, the fact that it can scour popular content from the web, gives your social posting more varieties and the ability to draw more audience and hence, traffic. It’s almost like combining BuzzSumo and Buffer together, only at a much cheaper cost. 3 – At its core, the automation feature is very easy to use, nothing to install onto your PC and can save you a lot of time from doing things manually. This will free up some space and let you dedicate to other works that matter more in your online business. 1 – I don’t know if there’s still any merit to using Tumblr for blogging, but out of the three, I found Facebook to be the most important platform. Yet, it doesn’t cover other networks that are equally gaining traction among online users like Pinterest and Instagram. That would be a bummer if you are a big fan or those two and need help posting in those channels. 2 – On the promo page, I found some information to be quite misleading. Apparently, the software can ‘speed up traffic acquisition’ without having to go through slow techniques (like SEO) and expensive ones (like paid ads). Heck, you don’t even need to create your own content anymore since there are so many popular topics that can be leveraged from! 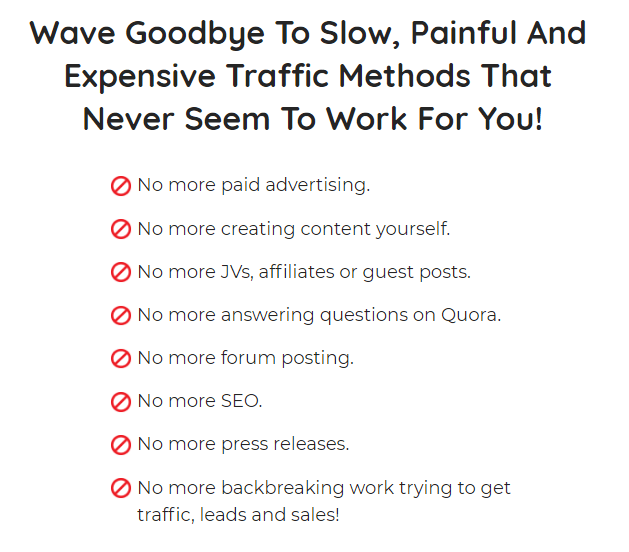 If you read those lines and think that this program is going to be a quick fix to your traffic problems, then you are totally getting the wrong impression. This is what we, marketers often called as the ‘shiny object syndrome’. A brand new software that promises to have the best technology like no other that can explode your profit for the least amount of work and money – who doesn’t want that, right? Wrong, because programs that claim to offer such and such are usually short-lived. This isn’t to say that Viral Traffic Builder is a bad product, but you need to take those words with a pinch of salt. Plus, the software has just been launched – the promo video only has about 600+ views and the user reviews are somewhat obscure. We don’t really know what’s in it for the long term, so it’s not wise to depend on it 100%. 3 – Social posting automation can be a tricky task for any type of online business. Social platforms change their policies all the time to prevent rampant sharing of fake news and online spamming so there’s a tendency to restrict what type of activities you can and cannot do. For example, since the beginning of 2019, Twitter has been restricting the usage of duplicate content and simultaneous bulk actions like retweeting and following. Meanwhile, Facebook’s new ground rules state that users must now log onto the platform to post and schedule content instead of using automation process. So it begs the question, will using this software lead to any negative impact on one’s traffic for the long term? We don’t really know for sure yet because it’s still new and not widely tested by many people. So, Should You Buy Viral Traffic Builder? Frankly, I don’t see a tremendous harm in using this software – at least not yet, but I would recommend trying it on a personal page first. If the stats on Google Analytics shows good social signals, then at least you know it’s working. But if the traffic escalates beyond an organic pattern that doesn’t make sense in terms of natural human capacity, then there’s a risk that you might be going against the rules of the social platforms. So, do keep an eye on that. For those who value in-depth marketing data, you might be better of with automation tools that have good proven track records. Yes, they are a bit pricer, but they are also managed by a team of people who are aware of the boundaries and best practices that work. These kind of tools have more advanced features, yet they still give you the power to control and manage the social feeds. In any case, automation should primarily be used to complement the distribution of your own content, NOT as a substitute for the entire marketing effort. At the end of the day, you are the face of your own business and if you rely on other people’s content all the time to gain traffic, there’s only so much that can be achieved in terms of credibility and authority within a niche. Plus, don’t forget that you also need to have real-time conversations going on. It’s not something that you can set on autopilot and forget about, otherwise it would completely defeat the purpose of social engagement. I hope this review has given you a clear picture on what Viral Traffic Builder is all about. What’s important is that I don’t want you to think that traffic generation is a complicated task. Good SEO practice is still one of the best ways to obtain long term traffic that can lead to sustainable profit, regardless of the level of social influence or whether you use automation or not. This is something you can benefit from my recommended training platform, so do check it out. If you have any questions/comments about this topic or tool, please share with us at the comment area below. I had heard about the Viral Traffic Builder and been wondering whether or not it was a scam. Funny enough, I thought the same thing as you – maybe it’s another bot program. After reading this review, I’m starting to see some legitimacy to this software. I think the essential thing to take away from this is the fact that automation is great for saving time, but like you said, they should never be used to replace the distribution of one’s original content. That is paramount. I could totally see some people using it just for that purpose and it’s only going to cause them to crash and burn. I’ve always wondered whether automation software like this would be worth getting. I’m glad I read this, because you’ve highlighted concerns I have regarding getting kicked off of social media platforms for too many repetitive posts. I’m pretty suspicious of anything that suggests I won’t have to create my own content anymore, too. As the saying goes, if it sounds too good to be true, it probably is. Thanks for sharing! As a new blogger who’s trying to get traction with traffic, this review showed me that sometimes, it can be hard to tell what is worthwhile and what is a waste of time and money. I have been posting on my social media sites manually, but it can be time consuming and difficult to stay consistent so the idea of it being done automatically sounds great. I’ll definitely look at different tools for better feature comparison. Very good review Cathy. My main concern here is the tendency to rely too much on other people’s content. For me, nothing beats good SEO and that’s one thing I would recommend people to learn first – creating your own content and sharing it – before purchasing automated traffic software like this one. Hey Cathy, this looks really interesting. After getting half way through my affiliate marketing training, and doing everything step by step, I can see where the traffic builder would help once you get several websites going. It appears to streamline all of your online tasks and gets you right to the money making. This might be something I want to try in the near future. Thank you.